Crispy fish, ranch dressing and Tex-Mex flavors (like jalapeños and cilantro) complement each other surprisingly well in this scrumptious salad. Line 15x10x1-inch baking pan with foil. Coat evenly with oil. Cut fish into 3x1-inch strips. Moisten with water, then coat evenly with coating mix. Arrange in prepared pan. Bake at 425°F 12 to 15 minutes or until fish flakes easily with fork. Meanwhile, place dressing, jalapeno peppers, cilantro and lime juice in blender or food processor container; cover. Process until smooth. Toss greens and tomatoes in large bowl. Add 1/2 of the dressing mixture; mix lightly. 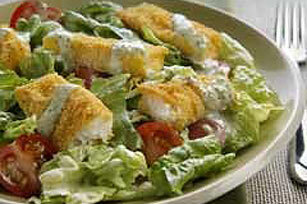 Top with baked fish fingers; drizzle with remaining dressing mixture. Jalapeno peppers and cilantro leaves may be finely chopped and mixed with the dressing and lime juice as an alternative to using the blender or food processor.